Since many years Help in Action has promoted the long distance adoption project in Nepal. The children accepted into this project are from families who are not able to support their education. Most of the parents are factory workers, weavers, beggars, cleaners or labourers working long hours on building sites or roads. After paying room rent and buying daily necessities, these families have no spare money to pay school fees. The children we are helping would not be able to attend school without the support they receive from their sponsors. Many of the families experience incredible difficulties – some have incurred debts to be able to enrol their children in school and they go forward making daily sacrifices in the hope that their child will find a sponsor. To stay in school and have a chance of a better future these children rely upon the help generously offered by sponsors. 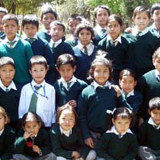 There are currently 265 active sponsorships of school children (aged between 4 and 16) in Nepal. We are also supporting a number of disabled children, monks and elderly people through the long distance adoption project. Every year the number of students having the possibility to enter into further education is growing. This year we are supporting 82 students who are studying in college and university. Most of them have chosen to study subjects that are most likely to help them to find work: hotel management, business studies, accounting, teaching and social work. This year we organised a meeting for the students about to enter further education – we invited speakers who had chosen different career paths to share their experiences with the students. We were happy to see that many parents also came along to share with their children this experience. For the academic year 2017/18 we were once again able to sponsor the music and dance classes for the children of Gangchen Samling School. All children attending the school, of whatever age, can participate in the classes which take place before the school day begins. 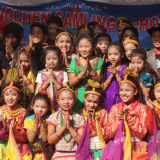 The children are really enthusiastic about the classes and put a lot of effort into preparing performances. It is wonderful to see the pure enjoyment they get – moments of fun and creativity. This year a very important and exciting project was started by the School: the transformation of a nearby building into a new school! The present school building is no longer able to house the growing number of students the school is attracting due to the high quality of the education and the good reputation it has in the area; the youngest children are educated using the Montessori method, and in all classes close attention is given not only to the quality of the teaching but also to the personal development of each child. The students of the school have obtained very high grades in the Government exams. Many families living in the area near the school, in the outskirts of Kathmandu, where income is very low, are asking for their children to be admitted – also in the hope that their child will find a sponsor! 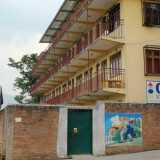 The present school building – although it did not suffer major damage during the 2015 earthquake – was beginning to show significant signs of wear and tear after 14 years of use: cracks in the walls need filling, doors and windows replacing, old bathrooms replacing and new ones built, repairs to the plumbing system… So the idea is to move the school into another much larger property: previously used as offices and storerooms the building was in need of work and modifications to make it suitable as a school, including the creation of numerous bathrooms! The new building will provide an extra 12 classrooms allowing the school to increase the number of students to around 650. There will also be enough space to start vocational training classes in the future, most probably for electricians and plumbers. The buildings are property of Tsetan Gyurme, our main benefactor in Nepal since the very beginning of our activities, who generously offers the use of these spaces and to whom we are very grateful. In many village schools children have to study without books and stationary. Most of their parents survive from subsistence farming and have very little money to buy even the basic necessities that they cannot produce. Stationary for school is a luxury that most people simply cannot afford. It is a pleasure for us to be able to give stationary to these grateful children as well as provide games and equipment for common usage. This year, we distributed stationary to about 250 children in 3 villages schools. We were also happy to help once again the children of Jorpati Orphanage. The orphanage is home to 26 children, of these 12 are in the Help in Action sponsorship programme. 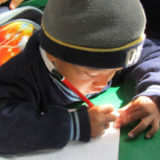 The Orphanage has very limited money so the gift of stationary and school supplies is a big help! The children living in the small group home of Hope Foundation also received school materials, as did the 55 young monks of Sed Gyued Monastery. The monastery now has 2 functioning schoolrooms that were previously furnished by us. To make sure the children have at least a basic education (to complement their monastic studies) two teachers have been employed to give daily classes. The monastery was supplied with enough books and stationary to last the academic year. Although the monks generally organise themselves – the older children helping the younger children, as well as a rota for general monastery duties and so on – it was becoming increasingly obvious that caring for 55 energetic young monks was becoming very difficult for the senior monks. From February we were able to provide the funds to pay for help with the cleaning of the rooms and bathrooms used by the smallest monks, the washing of their clothes and keeping the school rooms tidy. It also ensures that the youngest monks have a minimum of supervision to oversee basic hygiene. Despite efforts to teach the young monks how to brush their teeth – the dentist who ran the dental camp found that 80 teeth needed fillings, 2 monks needed root canal treatments and quite a few teeth needed extracting. Most of these young monks have moved to the monastery from remote villages – the change in diet (in particular access to sweet treats) has had a terrible effect on their teeth. We requested that the staff in the dental clinic gave oral hygiene information to each monk that went for treatment. Toothbrushes, toothpaste, soap and towels have been provided to the monks. Until recently most of the monks were eating outside – even when it rained – as the current kitchen area was too small to provide a seating area. This year a new dining hall has been built and we were happy to be able to provide some tables and chairs! The Shree Jana Bhuwana Primary School in Shikharpur (Makwanpur District) educates about 70 pupils from local villages. The school needs funds for paying teachers, general running costs, books, stationary and so on. It is now the third academic year that we have been able to sponsor this school. Last year we provided a small health post in Mawakanpur District with necessary equipment and medicine. The health post is responsible for the primary health care needs of about 8,000 people. During the monsoon season these people are completely cut of from any other medical services. This year we have sent a supply of basic but very important medical supplies to the health post: antibiotics, pain relief medication, antiseptic, cough medicine, vitamins… Outreach workers received first aid kits and essential equipment. As Nepal entered into the monsoon and temperatures started to drop we were able to distribute blankets, clothes, shoes and stationary to villages in the Sindapulchowk District. 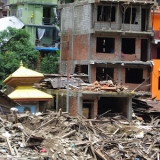 These people are still in desperate need after the 2015 earthquake and were still waiting for aid to arrive! Particular care was given to make sure that elderly and sick people received materials that will them through the winter months and all the children received school materials. Thanks to the important help received from the Waldensian Church that supported our fundraising project, the work of repairing Gangchen Drupkhang – after the 2015 earthquake – was fully completed. Gangchen Drupkhang was built in 2006 with the aim of creating a base for activities and professional training in traditional Himalayan handicrafts and culture: hand carved furniture and decorative objects, traditional painting and artwork, healing incenses and herbal remedies of the ancient Tibetan tradition. 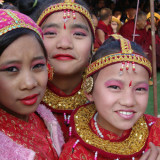 Through it’s varied programmes the Drupkhang is aiming to safeguard and promote the traditional Himalayan culture by creating very real opportunities for training, employment and social inclusion, especially aimed at people in particular need: mothers in difficulty, young people, unemployed with families to be supported and the disabled. and every one of you our most heartfelt and sincere thanks!